Voters in New Jersey and Virginia head to the polls today to elect a governor, several states consider ballot measures and many cities choose a mayor. While state and local off-year elections draw less media attention than presidential or congressional elections, Americans look on their state and local governments more favorably than they do the federal government, according to an April Pew Research Center report. The share of Americans with a positive view of the federal government fell to 28% in April, five points lower than the previous year, while public favorability of state government ticked up five points to 57%. Fully 41% of Democrats held favorable views of the federal government, compared with only 13% of Republicans. By contrast, state and local governments are viewed favorably across party lines: 56% of Democrats and 57% of Republicans said they had a favorable opinion of their state government. 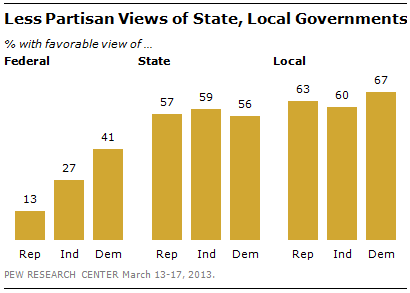 But the partisan makeup of the state government matters: Republicans give more positive ratings to GOP-led state governments, while Democrats rate Democratic-led state governments more highly. 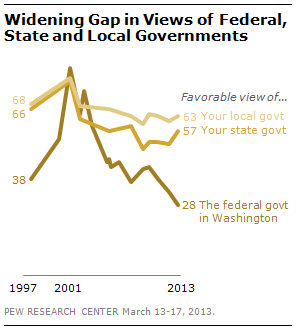 Similarly, local governments also received positive ratings, with 67% of Democrats and 63% of Republicans seeing them favorably. In another measure of views of Washington, a survey conducted just before the Oct. 16 agreement to end the government shutdown showed that public trust in the federal government to do what is right just about always or most of the time fell to 19%, down seven points since January.